I'm two hours late. I hate that I'm two hours late because I know it's already in full swing. I've been waiting for this for months. To my surprise, someone answers when I ring the doorbell. It's Chris (callsign: "Spartan 117"). "Brandon! You know on a Halo Sunday you don't right the doorbell," he says. "You walk right in!" And there they all were, looking like three and a half years hadn't gone by at all. 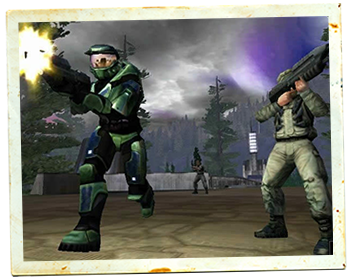 The Spartans of Halo. My Spartans of Halo. After a round of handshakes, I (callsign: "No Name") ask everybody how they're doing. When it gets to Dennis (callsign: "Diglo"), he says with pride: "I got a baby on the way." Without missing a beat, Rob (callsign: "Devon Roma") breaks in, pointing at his stomach: "Yeah, you're starting to show a bit." Laughter ensues, filling the room, and the house. Yeah. Some things never change. For me, it all started with a barbecue in the summer of 2003. My dad's neighbour, Dennis, happened to mention that he was a big fan of Halo, which had already been out for more than two and a half years at that point. Dad told Dennis that I was also into Halo, despite the fact that I hadn't actually played the game in a very long time. I got called over, and ten minutes later, I was invited to something called "Halo Sunday." The chit-chat lasts for about five minutes. We'll catch up later. It's time get back into the game. The teams are reshuffled now that I've shown up, and I soon find myself sectioned off in a room with Chris, Dennis, and Goggles (real name: "Kevin," but nobody calls him that on Halo Sunday). Like old times, we all sit around our own console and TV, connected to three others about the place, as that simple, lovely sound of chanting choral voices brings back a sudden swell of memories. I feel weird holding an Xbox 360 controller playing a game that predates the thing by four years. As the countdown timer begins, then is halted, then begins again while Chris yells at everyone in the house to actually pick the right damn team ("Guys! We're blue! GUYS! Switch to BLUE! "), I try to hit the black and white buttons, and realize they don't exist anymore. Then I wonder with a start if I'll remember how to play this game. Halo doesn't care if I'm ready. The beep sounds, and we begin. I was hooked five minutes into my first Halo Sunday. Soon every week of that summer was punctuated by the day I met up with my fellow Spartans. I didn't know that I was part of a console revolution spurred by the game, introducing us to something called a "LAN party." I didn't know that PC gamers were scoffing at this wave of gaming culture, saying that it wasn't a big deal because they havd been doing it for years. Honestly, I didn't really care. All I cared about was that I now had a group of friends that understood me when I talked about pistol combos, the Covenant, and "fuzzy blue spiders."